One day my food-partner-in-crime Jason sent me a Costco link. 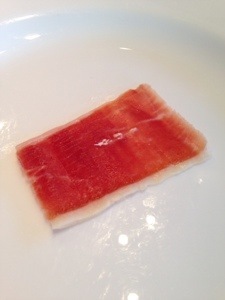 The link advertised a gorgeously aged, imported from Spain, Jamon Iberico. The price tag, $1000. What is so special about this ham you say? Well for starters it’s imported from Spain, and even the spaniards consider this meat a delicacy. The pig itself is a special breed. Black hoofed, feeding mostly on acorns, and only raised in certain areas of the peninsula, this pig once cured, develops the most mouth watering flavorful ham ever. After a quick discussion with my fellow family members, it was agreed upon that the holiday of 2012 would be the perfect occasion to splurge for this ham. Plus, with Costco, it most likely would not be available for much longer. The final decision was of course, to splurge how much? The $1000 Jamon was aged a lengthy 39 months. Having had some smidgen of common sense left in our consciousness, my dad agreed to make-due with the $550 one which was aged 24 months. He calls this our “practice ham”. For the record my mom, brother and husband all thought we were crazy for spending this kind of money, but I hope the real culinary coinassours out there will disagree. The order was placed, and we all patiently wait. New Years Eve arrives, and the package is delivered at noon, right on schedule. 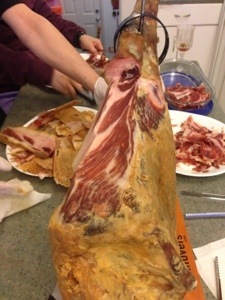 What emerges from the box is not only a tantalizing Jamon, but is a masterpiece waiting to be assembled. Ham, wooden stand, and carving knife, all conveniently dropped off by the UPS truck. 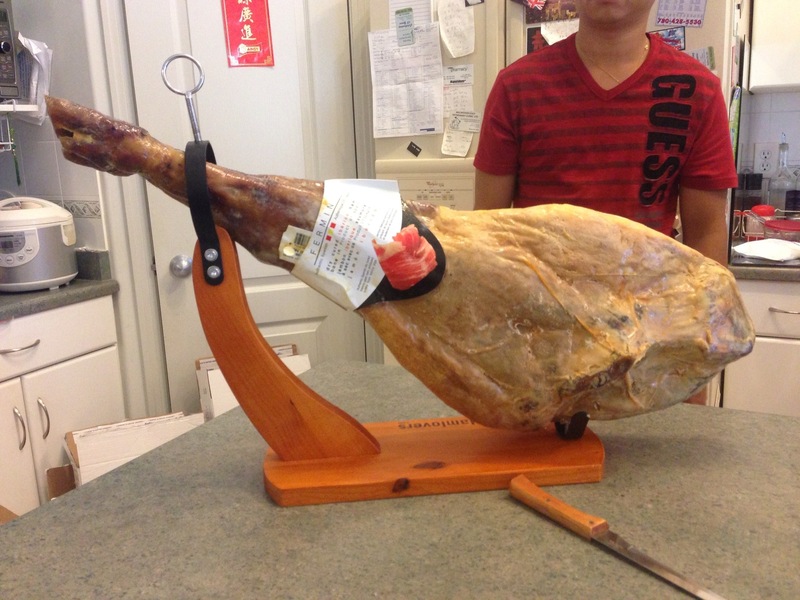 The Jamon itself weighs a hefty 12.5 kg. What percentage of that is pure meat is still to be determined. The assembly begins with a little online video tutorial. 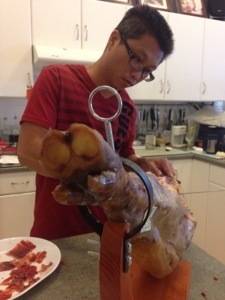 www.tienda.com has a great clip on how to care for, carve, and store your ham. We are advised to let the meat rest at room temperature for 1-2 days, but with my brother and girlfriend leaving back to Calgary that day, we had no choice but to dive right in (I know… even after he called us crazy). With the hoof end of the leg securely clamped in place, we were ready to carve! According to the tutorial, there were multiple parts of the leg to carve from, each with there own unique flavors and ratios of meat and fat. We decide to tackle the babilla, which is the rump end of the ham, or the top section when the leg is positioned with the hoof facing down. We start by slicing away large portions of skin and fat, putting them aside as we were instructed to save it for re-covering the ham afterwards. As we take turns carving and getting to know the pressure required and motion of the knife, slowly, perfect paper thin slices of beautiful ham were laid upon a snow white plate. Maybe it was the anticipation. Maybe it was the build-up of excitement. Or maybe, it was just that damn good. This was the greatest slice of cured meat I have ever had. The flavor was distinctly pig, the saltiness was of a perfect amount, and the texture was almost silky. The ratio of meat to fat was such a wonderful combination, it melted in your mouth. Between bites of Jamon and sips of sherry, one could almost believe, almost, that my mom’s messy kitchen was the beautiful countrysides of Spain. La Punta was the last section, located on the opposite of the hoof. Sadly we did not get to experience this side as my mom had harvested the meat one afternoon, most likely out of boredom. According to her, it was a bit tough and not as pleasant. I guess we’ll have to wait for the next ham to verify that opinion. Looking back, I must say that this was one of the best food experience I’ve ever had. Yes it may have cost $550, but for the experience it gave us, I could almost say it was priceless. It allowed us as a family to spend hours together, talking, laughing, bonding, sipping sherry. We were able to satisfying our curiosity for Spanish culture, giving us a taste of what delicacy that country can offer. Would I do it again? I wouldn’t even have to think twice about that answer. I guess we had better start saving up for next Christmas.